Caden Flynn runs for yardage against Pleasant Friday night. Pleasant running back Bryce Lowry is stopped by the Colts defense Friday night. Clear Fork won 16-14 on a field goal in the fourth quarter. 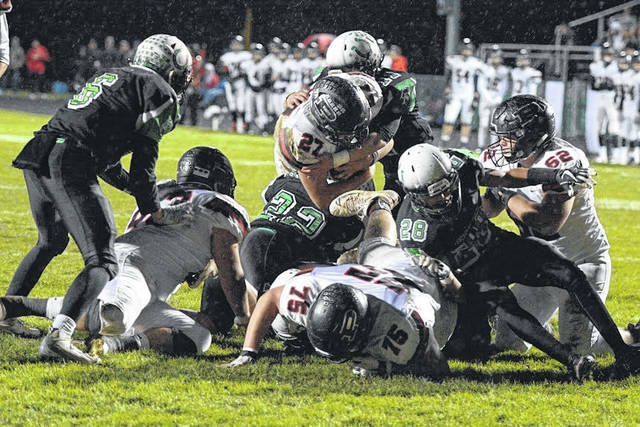 Clear Fork defenders stop a Pleasant ball carrier during its win Friday night. Trevon Trammell juggles a catch for Clear Fork Friday night. The Colts won 16-14 on a field goal in the fourth quarter to go 9-0. 1. 9-0 378 Clear Fork 24.2889 44.0 194.0 100 clinched home game. 2. 9-0 1012 St Marys Memorial 22.9278 47.5 176.5 100 clinched home game. 3. 7-2 1596 Van Wert 16.4000 36.0 124.0 100 control own destiny. 4. 8-1 380 Clearview 16.3222 38.0 121.0 100 control own destiny. BELLVILLE — Instant Classic II. Cleark Fork and Pleasant, a year removed from a thrilling overtime game in Marion, engaged in another great one at the Colt Corral Friday night. And again it was the Colts, thanks to a Gabe Blauser 27-yard field goal in the closing minutes, that beat the Spartans, 16-14, before a packed house. “I’m still coming down from that one. Wow,” said Clear Fork head coach Dave Carroll moments after the win. The Colts are now 9-0, 5-0 in the MOAC and should move to first in Division IV, Region 14. The win locks up a home-field playoff game in the first round and guarantees them at least a share of the MOAC title. The visiting Spartans took a 14-7 lead at halftime, thanks to a strong running game and a stout defense. “I told the kids at halftime, this is nothing. We were down last year 14-0, so we were all right,” Carroll said. 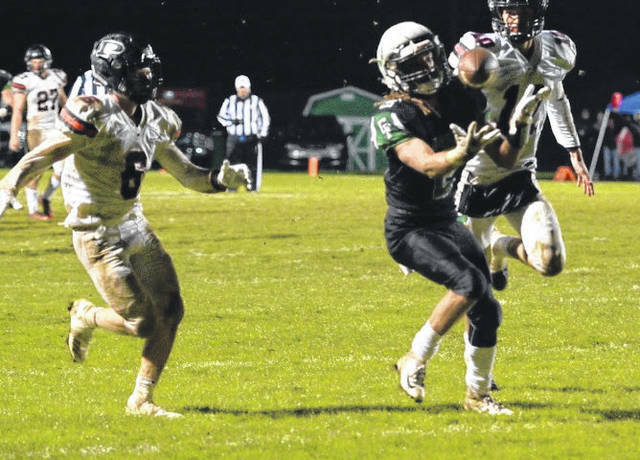 Pleasant is now 7-2, 4-2 in the conference and are sixth in Division V.
“I was a a little nervous, but I just cleared my head and kicked it through,” Blauser said of the winning kick that came with 3:27 left in the rain-soaked contest. He had missed a potential game-tying extra point earlier in the quarter after a 36-yard touchdown pass from Jared Schaefer to Trevon Trammell. “I had made kicks from 45 yards out in practice. It’s what we (kickers) dream of,” Blauser said. Carroll praised his kicker’s efforts and added that he thought the extra point was good. “He’s a great kid. I knew he was going to nail it. But the biggest play he made was dropping their quarterback (Ethan Warner) on that last drive,” he said. Blauser also averaged 46 yards on a pair of punts. Warner’s 4-yard touchdown run knotted the game at 7-7 in the first quarter after Clear Fork struck first. Brennan South found Zach Homerick for a 37-yard scoring pass to open the game. 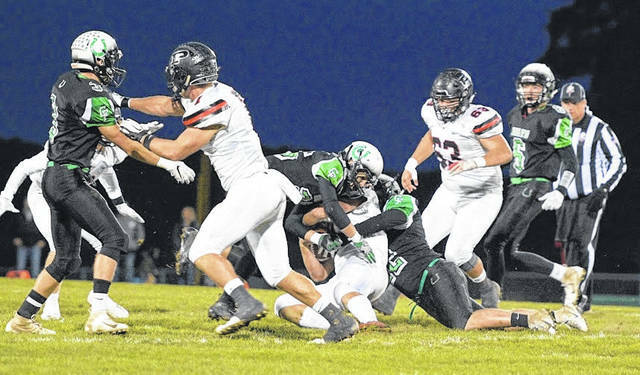 Schaefer (138 yards) and South (146), as has become customary, teamed up to pass Clear Fork to victory. “Their run defense is incredible. Number 27 (LB Bryce Lowry) started last year. It takes a great effort to run against them. We had to pass and were able to make some things happen,” Carroll said. So the Colts did just that and opened things up. The result was A.J. Blubaugh caught 8 passes for 103 yards and Homerick added 88 on 2 receptions. As a testament to the Spartans defense, Trammell was held to 2 yards on 7 rushing attempts. 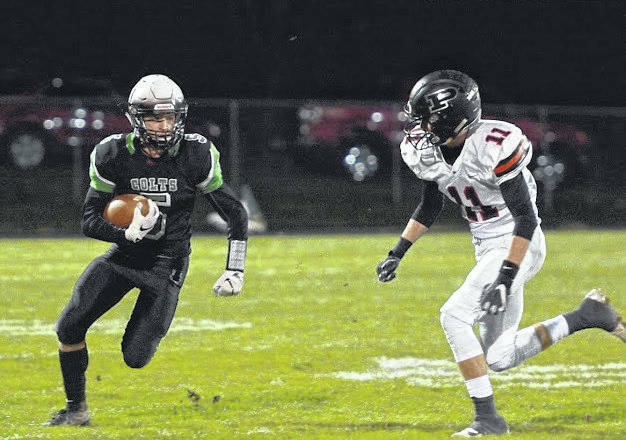 Schaefer wound up as Clear Fork’s leading rusher with just 30 yards on 12 carries. Spartans head coach Aaron Cook said it was a tough game between two strong programs. His team ran for 243 yards on 52 carries, led by Patrick Blubaugh’s 117 yards on 20 totes. “We knew we could move the ball against them. But we missed some opportunities here and there,” Cook said. Clear Fork had 16 first downs to Pleasant’s 14. The Colts were flagged 4 times for 35 penalty yards. “If there’s one thing you can take from football and any sport, it is to never quit and never give up,” Carroll said. The Colts visit Marion Harding Friday night to finish the regular season. https://www.thebellvillestar.com/wp-content/uploads/sites/39/2018/10/web1_Colts-Number-5.jpgCaden Flynn runs for yardage against Pleasant Friday night. https://www.thebellvillestar.com/wp-content/uploads/sites/39/2018/10/web1_Defense-defense-defense.jpgPleasant running back Bryce Lowry is stopped by the Colts defense Friday night. Clear Fork won 16-14 on a field goal in the fourth quarter. https://www.thebellvillestar.com/wp-content/uploads/sites/39/2018/10/web1_no-room-to-run.jpgClear Fork defenders stop a Pleasant ball carrier during its win Friday night. https://www.thebellvillestar.com/wp-content/uploads/sites/39/2018/10/web1_Number-2-juggling-catch.jpgTrevon Trammell juggles a catch for Clear Fork Friday night. The Colts won 16-14 on a field goal in the fourth quarter to go 9-0.